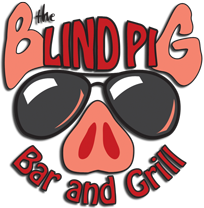 The Blind Pig | Do it BIG at The Blind Pig! A speakeasy, also called a blind pig or blind tiger, is an establishment that illegally sold alcoholic beverages during the great prohibition. Such establishments came into prominenece in the United States during the Prohibition era (1920-1933, longer in some states). During that time, the sale, manufacture, and transportation (bootlegging) of alcoholic beverages was illegal throughout the United States. But at The Blind Pig in Little Rock, Arkansas, it’s all totally legal! It’s the perfect place to eat, drink, and relax. We hope that you enjoy your visit and come back again and again! So, WELCOME TO THE BLIND PIG est. 2013, where it’s GREAT to be a pig! We have all the Razorback football games and great food and drinks special during the football season! Do it big at The Blind Pig! Tues: Open For Lunch 11am until 2am. Wed: Open For Lunch 11am. to 12 am.